This is one the ‘Best Way to Calibrate a 3d Printer‘ series. 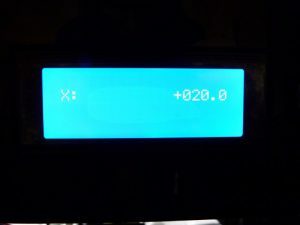 This post deals with the issues of settin up the z-axis of your printer. Without the build platform being level the print may not stick or there may be damage caused by nozzle collision. One of the most important areas of the 3d printer to get right is the initial height of the nozzle away from the bed. If it is wrong by being too far away – then the extruded plastic will not be pressed down onto the bed. Causing poor quality first layer adhesion along with the possibility of dragging the plastic on corners. If it is wrong by being too close, you run the risk of nozzle bed collision. This can lead to destroying the nozzle or digging into the bed and causing grooves. You can prevent the extruded plastic from coming out of the nozzle, and it will go somewhere, causing blockages necessitating cleaning of the hot end. Get it right and your printer will give you print after print that you will be happy with. TIP1:There are certain thing you will need to make sure you do routinely when you switch on the printer, one is to auto home the printer. TIP2: Ensure that there is no plastic coming out of the nozzle. As PLA is brittle, gently wiping a finger nail across the nozzle end will break off any protruding plastic. 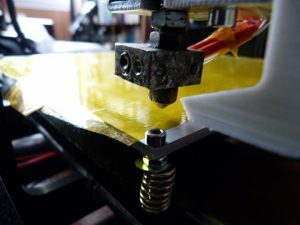 If this is not carried out before checking or setting the z axis you will find that when you start printing you are miles away from the build platform, this is the plastic which was protruding from the nozzle giving you errors. Don’t forget the hot end will be hot for a while after you stop printing. Do not carry out the removal of the plastic with fingers until the hot end is cool, or use tweezers to remove the plastic while it is warm. 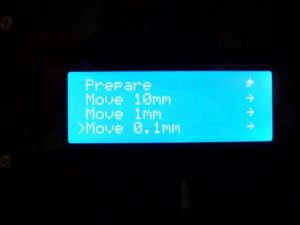 Most printers have a manual move function built into the onboard controller. 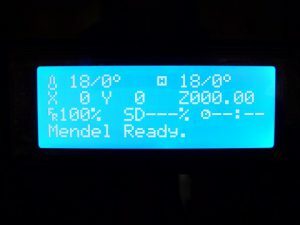 The home screen on my machine shows the temperatures of the hot end and the bed, along with the other information like the x,y,z position and % print complete. 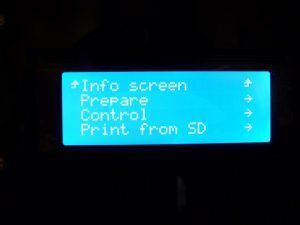 If you press the rotary knob when on the main screen you enter the menu structure of the printer. Rotating or scrolling the knob to get the cursor down to the [prepare] menu item and pressing the knob to enter the menu will get you to a sub menu with the main functions. Scroll right down to the bottom and you see [move axis]. Press the knob to enter this menu . next – scroll down to [0.1mm] and press the knob. 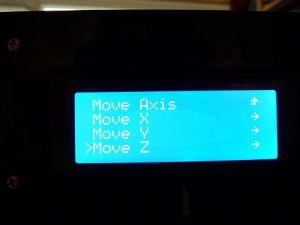 The four axis are on the next menu, x,y,z and extruder. Scroll down to the [z axis] item and press the knob. If your printer has just been switched on the last position the printer was left in is the 0,0,0 point for the x.y.z axis respectively. The machine will not remember you left it hanging in the air and know that it is 20mm up on the z axis. If you didn’t auto home the machine before you switched off, go back to the main menu and scroll down to [auto home], pressing the knob will allow the machine to find the endstops and home the machine, see TIP1 above. It now has a reference point to work from. Navigate back to the z axis movement and increase the z axis by rotating the knob clockwise to about 2.0 representing 2mm. My machine has a zero point which is not over the build platform, so to get the nozzle over the platform I have to move the x and y axis. I have moved them by approximately 20mm each. I try to use this as a known point and go there every time I want to check the z axis calibration. 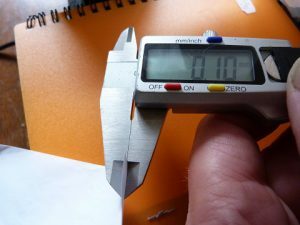 With a piece of paper, which I measured at 0.1mm. Place this on the build platform under the nozzle. Dependent on the time it has taken to find the paper and place it under the nozzle the screen may have defaulted back to the home screen. This, I find is one of the most annoying habits of the printer, you will have to navigate back to the z axis to now move it towards the build platform. Don’t just rotate the knob anticlockwise so that the z axis goes to zero, gently rotate it and moving the paper between the nozzle and build platform, try to stop when you feel resistance on the paper. If the z axis is now at 000.0 brilliant, if not you will need to adjust the height of the build platform. There is too much gap between the build platform and the nozzle, if you print in this state the first layer will not be pushed onto the build platform and first layer adhesion will probably not stick. What you need to do is to adjust the corner wing nut closest to the nozzle in a clockwise direction. TIP3: When building the machine I thought that when adjusting the build platform it would be tricky with an allen key and turning the lower wing nut. You would be likely to get a false reading due to the pressure being put onto the allen key. I have added a nut under the metal build platform to effectively lock the allen bolt in place, this prevents it from turning when the wing nut on the bottom is rotated, allowing you to adjust it single handed. 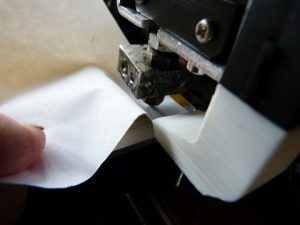 You need to be moving the paper under the nozzle and stop when it starts to be caught between the nozzle and build platform. As with above by now the display will have defaulted back to the home screen, navigate down to the z axis movement. Press the knob, scroll down to prepare, push the knob, scroll down to move axis, press knob, scroll down to 0.1mm, press knob, scroll down to z axis. (it becomes easier to remember – it doesn’t mean I like it) . 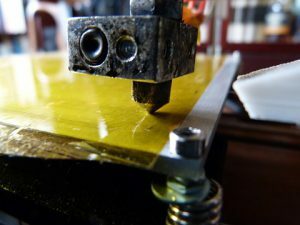 Raise the z axis to approximately 2mm and then lower it again, moving the paper while lowering the nozzle. Does it feel the same as before, just catching – yes! good. The build platform is too high. 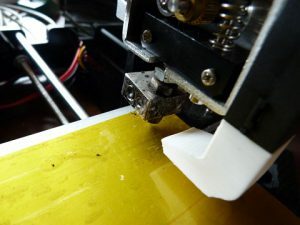 You need to raise the z axis and ensure that there is no plastic protruding from the nozzle, if there is use a pair of tweezers to break it off and lower the axis again. If there is no plastic protruding then you need to adjust the build platform down. The wing nut needs to be rotated anticlockwise when seen from the top. This will screw the wing nut onto the screw thereby shortening the gap and bringing down the level of the platform. You should be able to adjust the build platform low enough for the paper to just have resistance between the nozzle and the build platform. If this is not the case you may need to adjust the z axis end stop up and retry this procedure. This can happen when first carrying out the procedure. But shouldn’t happen after unless there is a major problem. So if you have been able to set your z axis in the past look for the problem before adjusting the z axis end stop. Raise and lower the z axis and ensure that it reaches its stop with the paper having the same resistance as before. Raise the z axis to 1mm (ish). The reason for this is if the build platform slopes up towards the other corner you are going towards the nozzle will collide with the build platform and possibly damage it. What I do is to chase the nozzle with the paper between the nozzle and the build platform, anytime it gets tight I will adjust the corner I am going towards to increase the gap. Remember the nozzle should be 1mm above the build platform so should never get close enough to pinch the paper. Press the knob to get you back to the axis menu. Scroll down to the x axis and press the knob. Increase the x axis to almost maximum ( my maximum is 205mm). This should bring the nozzle close to the other front corner. You now need to go through the routine of lowering the z axis with the paper between the nozzle and the build platform. Try to make sure that the resistance on the paper is the same as before. Raise the z axis by 1mm (ish) and press the knob. Scroll down to the [y axis] menu item and press the knob . 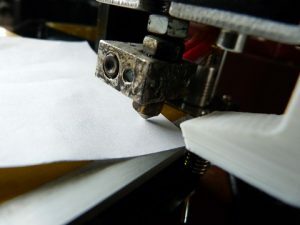 Move to the back corner and go through the procedure of placing the paper between the nozzle and the build platform while lowering the z axis. Adjust if necessary. Move the x axis to the last corner and perform the same routine. Once you have adjusted all four corners, if you have had to make large adjustments you will need to go back through all of the corners again. It can be tedious but you will not be carrying this out every time you switch it on. There are certain changes you make to your printer which will mean that you will need to carry out this procedure. 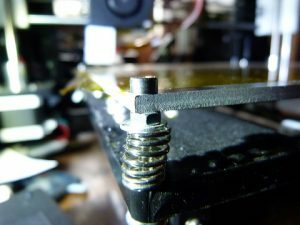 So essentially any major procedure involving a hot end strip down or stuck prints on the build platform you will need to check the calibration of the z-axis. It is tedious and you may feel that you can get away with printing at the front and only adjusting the front two screws, I did this and the printing started failing when going above a 20mm print. The back was not sticking and followed the nozzle. The print top surface was shiny one side and not the other. In the end I gave in and adjusted the build platform. It took the best part of two hours, but I now can print on any part of the build platform. 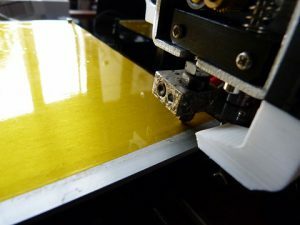 The top surface of the print is equally shiny and there is no problem with first layer adhesion. So yes it is worth it. As stated before it is worth keeping a record of what you have done, maintenance or changing filaments. You can build up a record of what you need to carry out when you change things. 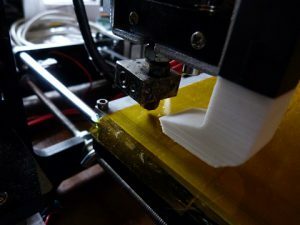 Making it easier to get prints which are consistently good. 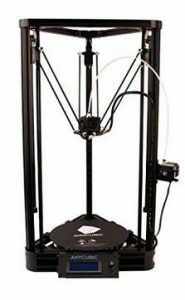 Please let us know what your best way to calibrate a 3d printer for the z-axis is by adding it to the comments box below.